The Northstar Ju Jitsu network of schools held their Fighting Spirit tournament at Balmain HQ. Ben and Daz give their comments on the tournament. It was great to see competitors from all of the schools participate in the event across the division of women’s sparring, young men (Colts), novice adult sparrers and advanced adult sparrers. A high level of skill was demonstrated and some truly memorable matches were witnessed. Age was no barrier to performance, with experienced ad beginner fighters doing very well! The friendship and respect among competitors and schools was a credit to all who participated. Sensei Andy and all of the dojo leaders consider it very much a success! 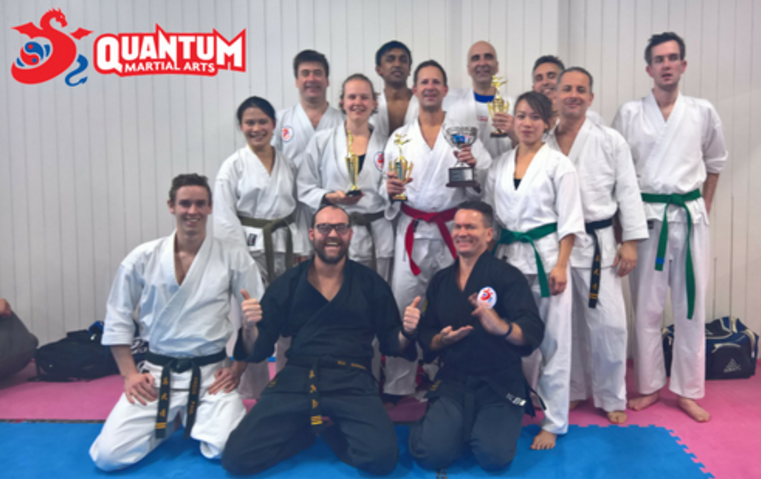 Quantum Martial Arts was well represented with competitors. Jess Wood took out the women’s division, Sam Lambropoulos took out the adult novice division and Dan Linders took out the adult advanced division. Well done to all competitors. Spirit is an important part of the whole Northstar Ju Jitsu system. So, what is “spirit”? One definition that I saw…and liked…is that spirit is the non-physical part of a person which is the seat of emotions and character; the soul. It is something that shines through on somebody, particularly when faced with any type of adversity. It can be your guiding light in uncomfortable situations, or it can be your worst enemy. How you build your spirit over time is how you will react in uncomfortable situations. From a martial arts perspective, we build spirit by training hard. When you train hard and push through your boundaries, you develop that knowledge that you can conquer challenges that are thrown your way. That knowledge may not occur overnight, but it slowly yet surely develops. When you get used to conquering challenges, you develop a real self-confidence. And when you have the confident can-do attitude, it really shows through in your character. I believe that the “Fighting Spirit” tournament was aptly named. It takes courage to step on the mats, in front of a lot of people, and just compete. You could get hurt. You could lose. You are really exposing your soul for everybody to see. However, with all of the competitors, that was not a problem. Through hard training, they had already developed their spirit. Through developing their spirit, they had developed their self-confidence and character. And this really showed when watching the bouts. All of the competitors are people of outstanding character who I am proud to be associated with. They were there to compete with respect and integrity. This really showed on the night. I would add another element to the term “Fighting Spirit”, and that is that it is really hard to defeat somebody who does not give up. The world makes way for the determined person. Not one person who competed in the Fighting Spirit tournament gave up. They gave their all. That is why I feel that we did not have any losers in this tournament. Ergo, I would like to extend a massive congratulations to all of the “winners” of the Fighting Spirit tournament. The winners are not just the people who got the trophies and medals, but to all 25 people who competed. You are all winners in all of our books. So now that the “Fighting Spirit” is over, what now? There is an old saying that the real learning comes when the competitive spirit has ceased. I believe this to be true. To all of the competitors, take the time to reflect positively on what you achieved on Friday night. You overcame fears. You developed your character. You did really well. Think about you how you can apply the lessons in your training or in other areas of your life. Think about how you can help others with the lessons that you learned. Then go forth and start applying those lessons, winners!